Baltimore City Community Action Partnership offers programs listed below designed to move residents toward self sufficiency. 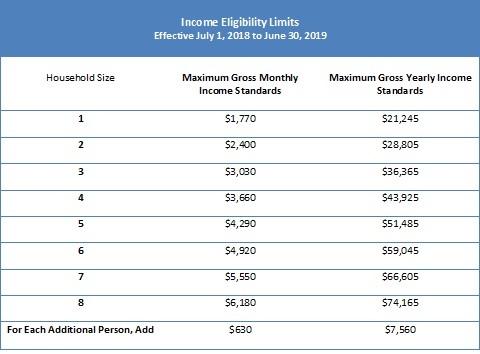 Homeowners and tenants (whose lease holds them responsible for paying the water bill), can apply each year for the discount if they are a Baltimore City resident age 65 or older with a combined gross household income must be $30,600 or less. Maryland Energy Assistance Program provides subsidies to assist low-income residents with heating and cooling bills. Community Action works in Partnership with the Office of Home Energy Assistance to make energy costs more affordable and thus minimize heating crises. 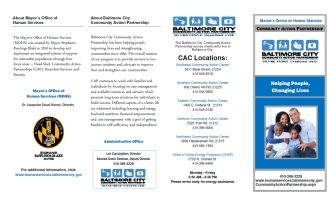 CAP works closely with the Maryland Energy Assistance Program (MEAP) and the Electric Universal Service Program (EUSP), which promote energy conservation, financial responsibility, and energy independence. The Renters' Tax Credit Program is a plan that provides property tax credits for renters who meet certain requirements. The plan was modeled after and designed to be similar in principle to the Homeowners' Tax Credit Program, which is known to many as the Circuit Breaker Program. The concept rests on the reasoning that renters indirectly pay property taxes as part of their rent and thus should have some protection, as do homeowners. The Homeowners Property Tax Program allows credits against the homeowner's property tax bill if the property taxes exceed a fixed percentage of the person's gross income. The program sets a limit on the amount of property taxes any homeowner must pay based upon his or her income. In partnership with the Baltimore CASH Campaign, our tax program offers free tax preparation and counseling for taxpayers who qualify. This service is available to low to moderate income families who cannot afford to have them completed professionally. Assistance in applying to various tax credits, such as EITC, is also provided. Money Smart is a financial literacy program that aims to help low-income individuals to achieve economic stability and financial self-sufficiency through a better understanding credit issues and through one-on-one counseling. Eat Healthy, Shop Smart is a food and nutrition workshop which provides nutritional education and food resources to sustain a healthy lifestyle and budget. Participants attend workshops each week for six weeks on topics related to healthy living and nutrition. The Community Action Partnership provides a multi-faceted approach to assist clients to become more self-sufficient. Upon intake, clients are assessed to determine what barriers exist that would interfere the economic stability of their household. After assessment, CAP staff utilize a variety of strategies—including employment assistance, training opportunities, tax preparation, and credit improvement—in order to increase the self-sufficiency of the household over time. Click here to download the CAP Brochure.